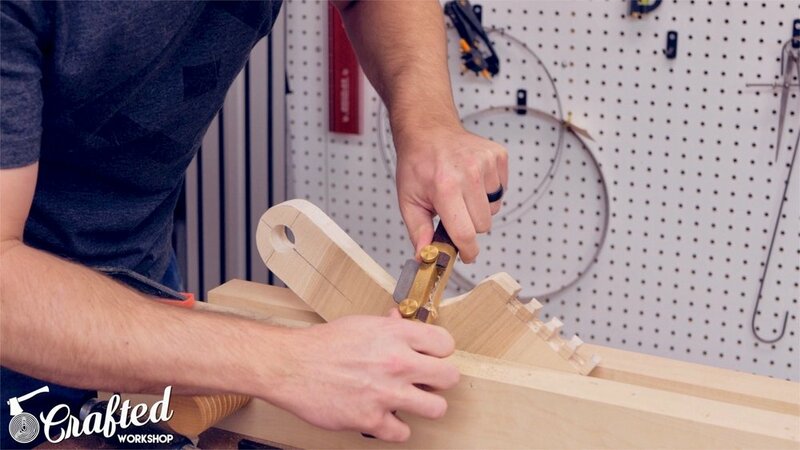 In this woodworking project, I'm building a hand tool tote using hand cut dovetails. This project was built so that I could bring a few hand tools with me to my week-long course at the John C. Campbell Folk School. Enjoy! I started this project by digging through my scrap pile and found a piece of Maple and Walnut to use for the sides of the tool tote. I milled these pieces square on the jointer, planer, and table saw, and then resawed the walnut on the bandsaw. The final thickness of my sides were roughly ⅜”, a bit thinner than ideal really. Next, I roughly drew the shape I wanted for the tall sides of the tool tote and then cut all of the pieces to length at the miter saw. 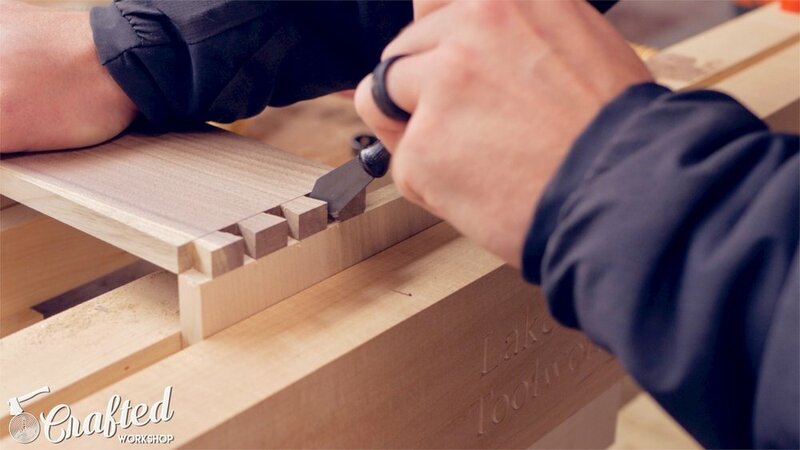 With all of the pieces to their final size, it was time to lay out the dovetails. I started by setting the depth of my marking gauge to match the sides, then transferred this line to the ends of the Walnut boards. I traced the line to make it more visible. I laid out my dovetails using dividers and walked them across the top edge of the board to set the distance. This distance is fairly arbitrary, just use whatever looks good to you. I’m using the David Barron dovetail guide in this video, and it is a perfect beginner’s tool for dovetails. 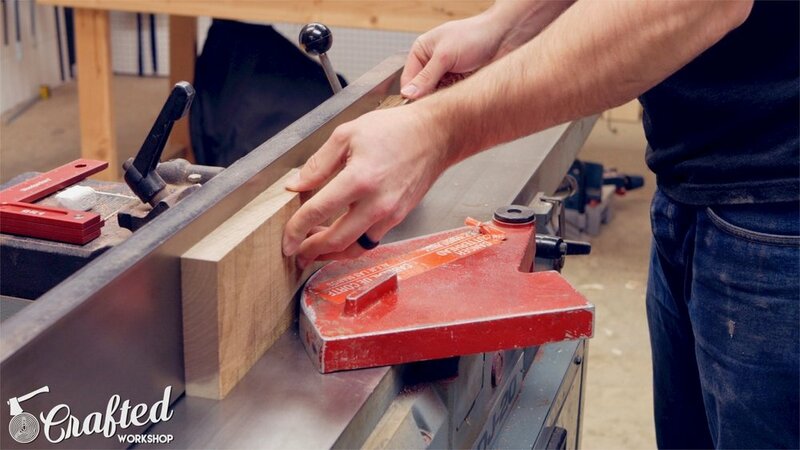 It uses a magnet to keep your saw at the correct angle and basically make cutting dovetails foolproof. This isn’t a sponsorship or anything, it’s just a cool little gadget. In this project, I’m cutting my tails first. I set the guide on the side, sawed to the base line, turned the board around, then did the other side. I’m left handed, so I had my saw on the left side of the guide. Also, make sure not to go past your base line, especially on the outside face of the board, since that will be visible. Next, I removed the majority of the waste with a coping saw or fret saw, making sure to stay proud of my baseline. With most of the waste removed, I then chiseled to the baseline, going halfway through then flipping the board. This is important, otherwise you can get blowout on the opposite side. I also slightly undercut the inside of the dovetail, meaning I had the chisels at a slight angle towards the center of the board, since this can help with the dovetails fitting later on. I cleaned up any areas that didn’t get chiseled out, then traced the tails onto the adjoining side using a marking knife. I traced the lines with pencil, to make them more visible, and also used the marking gauge to establish a baseline. On this round of cuts, I used the opposite side of the dovetail guide, and this allowed me to match the angles of the tails here on the pin board. Once again, I made my cuts, flipped the board, then made the cuts from the other angle. I also removed the majority of the waste with the fret saw. One thing to keep in mind is that the sides of the waste area are angled now, so make sure not to saw into the pins. Once again, I chiseled away the waste to my baseline, but this was a little trickier because of the angled sides. I eventually got it cleaned up, and the dovetails fit really snug. They certainly weren’t perfect, but they were good enough for a tool tote. Next, I laid out the exact shape I wanted for the sides where the handle connects. I used a few random round objects to get some nice rounded edges, then cut the waste on the bandsaw. I had a resaw blade installed, so I had to make quite a few small cuts to get into the curves. I drilled a 1-inch hole using a Forstner bit at the drill press, and this is where the handle will mount. Next, I refined the shape using a few different spokeshaves, a round file, and sandpaper. These spokeshaves from HNT Gordon are so much fun, and it also really helps to chamfer these edges before filing to prevent blowout. With the sides shaped, I separated them then sanded all of the inside surfaces up to 120 grit then glued the sides together. Since this was my first time glueing together a box with dovetailed corners, it took a little trial and error to get the order of assembly right, but I eventually got everything clamped up. Next, I cut the bottom to size from ¼” Luaun plywood and glued and brad nailed it on. 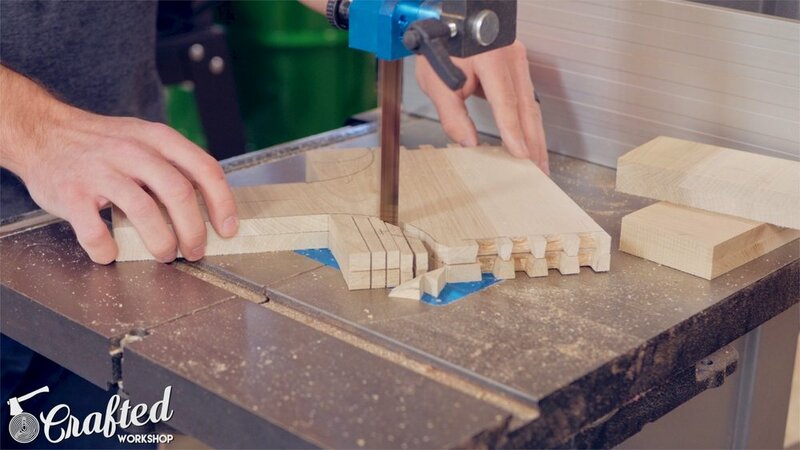 If you have any question about the strength of glued on bottoms, go watch Matthias Wandel’s video on strength testing glued-on drawer bottoms. Suffice it to say they’re incredibly strong. I flushed up the bottom to the sides with a block plane and also chamfered the bottom edges while I was at it. Next, I glued in the handle, which is just a 1” hardwood dowel, Poplar in my case. With the structure of the tool tote finished, it was time to work on the organization. First, I cut some of the scrap Maple to make a chisel rack. I cut strips of ¼’ plywood to serve as the dividers and just played with the spacing until the chisels I wanted to bring with me fit. 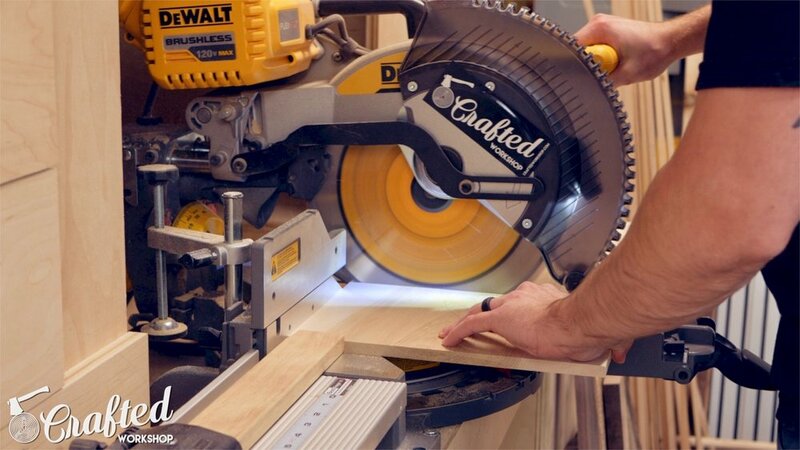 Next, I cut some more strips of ¼” plywood to serve as dividers for the hand planes. I added a little glue then set the plane on top to provide clamping pressure. Off camera, I also created a few pieces to hold my dovetail and crosscut saws by cutting a few blocks of wood and adding a kerf on the table saw. I glued these in. I also created a little hanger for my marking gauge from a few pieces of the scrap Maple. 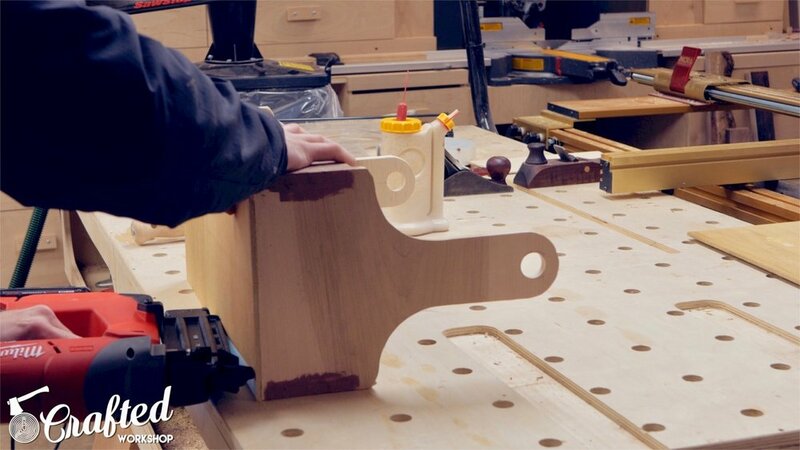 With all of the pieces added, I gave the tool tote a final sanding. For finish, I sprayed on a coat of shellac then added three coats of spray polyurethane.